Edward Hopper, Conference at Night (c. 1949). Wichita Art Museum. Via wikipaintings .org. None of what follows pretends to be something no one has ever thought of before, much less done before. I’m writing about this, though, in part to push myself with being a little braver with how I use images in class as a way of encouraging my students to look more closely at them and, perhaps, at traditional texts as well. So, bear with me. For many years now, I have used paintings as in-class writing prompts, as entrees into discussions of certain topics, and as the subjects for paper topics, and last year I created a prompt which asks student to write about a still from a film’s 70-minute mark–both the contents of that image and what it might reveal to us about the film as a whole that an uninterrupted viewing does not. (In case you’re interested, my inspiration for that idea comes from here; and here is my attempt to do the assignment myself (I am asking students for a minimum of a thousand words): 70-Minute Casablanca). I’m sharing all of this with you now, though, because our department chair has encouraged us to work with our students on becoming more attentive and patient readers, and it occurred to me that, in addition to modeling the reading of a couple of poems with my students, I could throw a painting into the mix as well. One of my favorite paintings to use in class is the one you see here, Conference at Night. 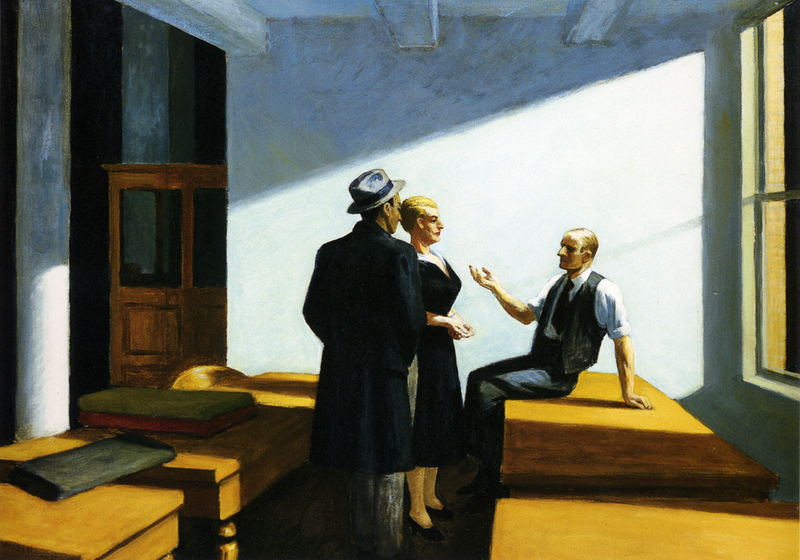 It’s a great painting by a great painter; it lends itself well to class discussions (even by Hopper’s standards, this one is especially enigmatic, appearing to be rather “So what?” at first glance but then becoming more interesting as we discuss it); and it happens to be here in Wichita (some of my students in the past have gone to see it in the museum after our having talked about it in class). (Just as a quick addendum, I also love using paintings by Vermeer in class, but they require more historical setting-up, which delays getting on with the discussion; I’ve also used some paintings by Magritte for short in-class writing prompts, but it’s harder (for me) to have a sustained discussion about them–they’re a little too enigmatic. I’ve yet to try a non-representational piece for this.) It so happens that last week, we had lively discussions about it in both of the classes that looked at it. Below the fold, I’d like to share some things that I say/ask about it to get conversation started, and some observations my students made on it; after that, I’ll do some musing about how to up the ante for making still more substantive use of it or some other, equally-suitable painting.